Electric vehicles: How much energy would we need to fuel them? If All U.S. Cars Suddenly Became Electric, How Much More Electricity Would We Need? 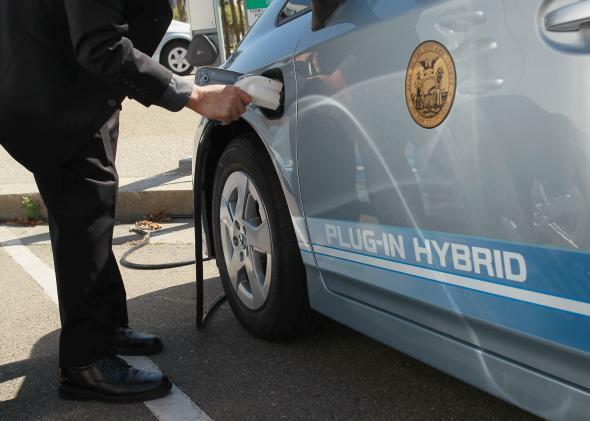 A Toyota representative plugs a power cable from a vehicle charging station into a Toyota Prius in 2010 in San Francisco. The U.S. burned 133 billion gallons of gasoline in 2012. I’m going to ignore diesel vehicles because the majority of diesel burned in the U.S. is in heavy vehicles where battery-electric drivetrains are not a practical option. The average thermal energy content in gasoline is 33.41 kWh per gallon. This gives 4,443 TWh of thermal power going to gasoline road vehicles in the U.S. per year. If we assume electric vehicles use energy with four times the efficiency of gasoline vehicles (a reasonable round number), it would take 1,111 TWh of electrical energy to replace that gasoline energy. U.S. electricity consumption in 2011 was 3,882 TWh. So the increase in yearly electricity demand would be about 29 percent. Now, let’s look at what this does to CO2 emissions. Each gallon of gasoline contains 8,887 grams of CO2. So the CO2 reduction from avoided gasoline consumption (assuming demand does not rise elsewhere to compensate) would be 1.182 billion tonnes CO2 per year. But this is the gross figure before increased electricity use is considered. If we assume the extra electricity comes from the existing mix of non-base-load sources (as nighttime charging likely would), the CO2 emission per kWh of electricity is 689 grams of CO2. So the total increase in CO2 emissions from increased electricity consumption would be 765 million tonnes CO2 per year. Thus the net CO2 emission reduction would be 417 million tonnes. Total U.S. CO2 emitted in 2012 was 6.526 billion tonnes. So the net decrease in national CO2 emissions would be about 6.4 percent. The average U.S. car costs $25,000. Presubsidy electric cars are running around $40,000. Now, this will come down with scale. But the “average” $25,000 car price today also includes many heavy vehicles and diesel-burners that skew up the average price. Small gasoline vehicles that are good candidates for replacement with EVs are cheaper—perhaps $20,000 on average. So at today’s costs, EVs cost $20,000 more than equivalent gasoline vehicles. But let’s be conservative and call it $30,000 for an economy-of-scale electric vehicle. This means $10,000 marginal cost over gasoline for a good round number. So there’s two cost cases to consider here: switching all cars instantly versus merely replacing all old vehicles with electric cars. For the extreme “instant” switch, around 150 million vehicles have to be replaced immediately, and gasoline cars lose all value. That would cost $4.5 trillion. For the “gradual” switch, where gasoline vehicles are run until the end of their useful lives, you only need to consider the marginal increase in cost over a business-as-usual case. So the cost would be $1.5 trillion. I think these are fairly conservative numbers. Reality would probably be somewhere in between the two. Taking the $1.5 trillion figure, that gives us an effective cost of CO2 reduction of about $3,600 per tonne CO2 per year. Amortized over 30 year vehicle life (which I think is extremely optimistic in the U.S.), that gives $120/tonne CO2 avoided. This is quite expensive. To be fair, EVs also have long-term savings in fuel cost, but the rest of the math is very conservative, so I don’t feel bad about neglecting this. Decrease the expected vehicle life to a more realistic number (considering battery longevity) or retire gasoline vehicles more aggressively, and the net cost per tonne CO2 number will come out about the same. I’m sticking with $120/tonne; I think it is a reasonable estimate. You’re welcome to disagree in the comments if you have a better number. This means electric vehicles are a pretty crummy way to reduce CO2 emissions, given the current U.S. power mix. You can do three times as much good per dollar by fitting coal plants with carbon capture systems. Not to mention even better alternatives like replacing coal plants altogether with nuclear, wind, or combined-cycle gas plants. Mass rollout of electric vehicles is only worthwhile in tandem with massive increases in renewables generation. Perhaps in the future we’ll get there. But today’s generation market trends do not support that assumption for the next several decades. Ryan’s answer is a reasonable calculation. However the most widely accepted published attempt to answer the question was a study commissioned by Xcel Energy a few years ago. They were trying to answer the question of 75 percent market penetration of EVs. The answer they got for their coverage territory (mostly Minnesota and Colorado) was 14 percent. Adjust that for answering the question of 100 percent market penetration and you get to about 19 percent. Why the difference between that and Ryan’s answer? Primarily because they factored in the reductions in reserves that are required to run the grid because unexpected things happen in load demand. To make sure the grid is ready, we overgenerate during certain times of the day. Since most car charging is done at night, when demand is lower and much more consistently predictable, reserve requirements are lower. Additionally, the overnight charging of EVs is much more predictable than most other loads. The consistency and predictability of EV charging factors in another important way, too: By having a stable and predictable load, the electricity generators can be optimized to operate at their most efficient settings, which means more electricity comes from the same amount of fuel. One other factor that’s present in the Xcel study is that it only looked at passenger vehicles. There are lots of other gas-burning vehicles (nondiesel trucks, motorcycles, etc.) that aren’t good candidates for electric conversion. Electric Vehicles:What are some mind-blowing facts about Tesla Motors? Energy: What are the top five facts everyone should know about oil exploration? Sustainable Technology: Should other nations follow Germany’s lead on promoting solar power?